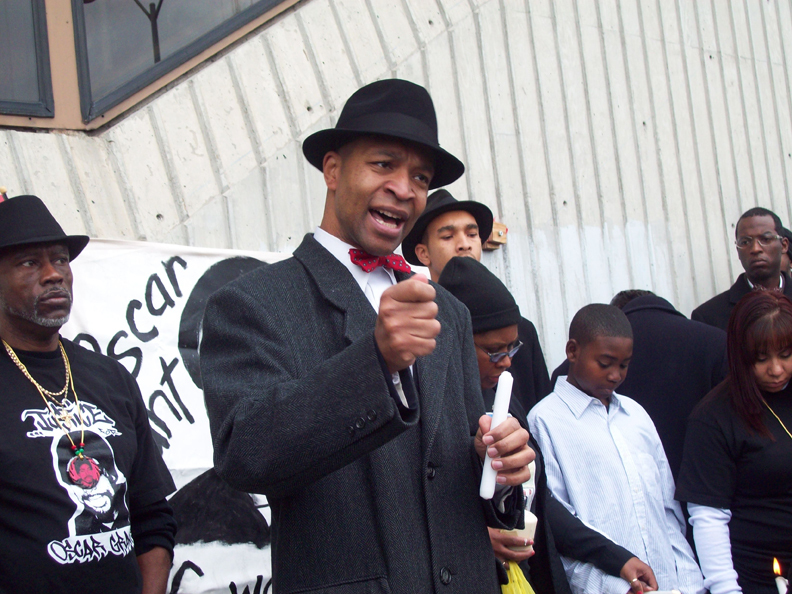 Oakland – Over 100 family members, religious leaders and community supporters held a prayer vigil and speak-out on New Year’s Day in front of the Fruitvale BART station to commemorate the second anniversary of the BART police killing of Oscar Grant, a young Black man. Grant’s murder sparked a series of protests and rebellions throughout California and around the country. Today’s rally also focused attention on the murder of Derrick Jones and others killed by the police. The vigil was led by Grant’s uncle, “Uncle Bobby,” Cephus Johnson. Johnson has worked tirelessly since Grant’s murder by BART policeman Johannes Mehserle to bring a coalition together to fight for justice for all people impacted by police brutality. 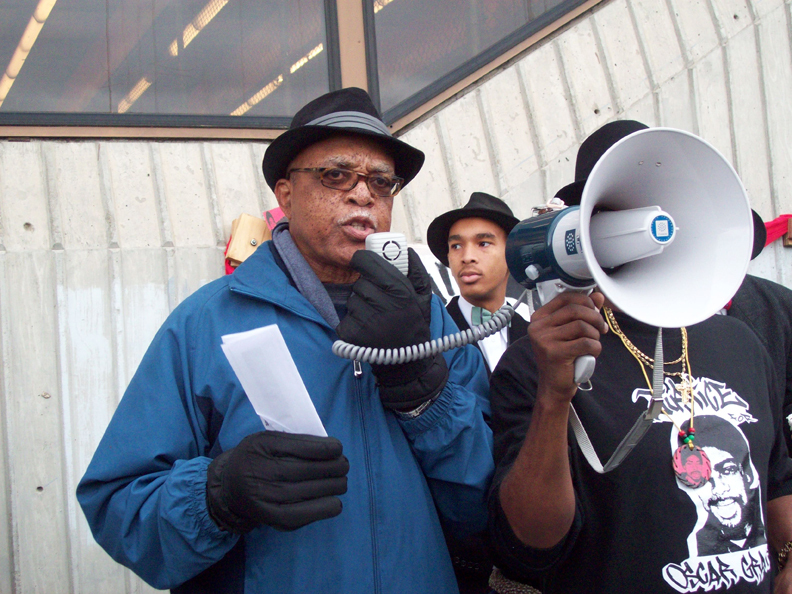 Uncle Bobby thanked the crowd for coming out today to demand justice for Oscar Grant. “It’s the community that enables us to continue. 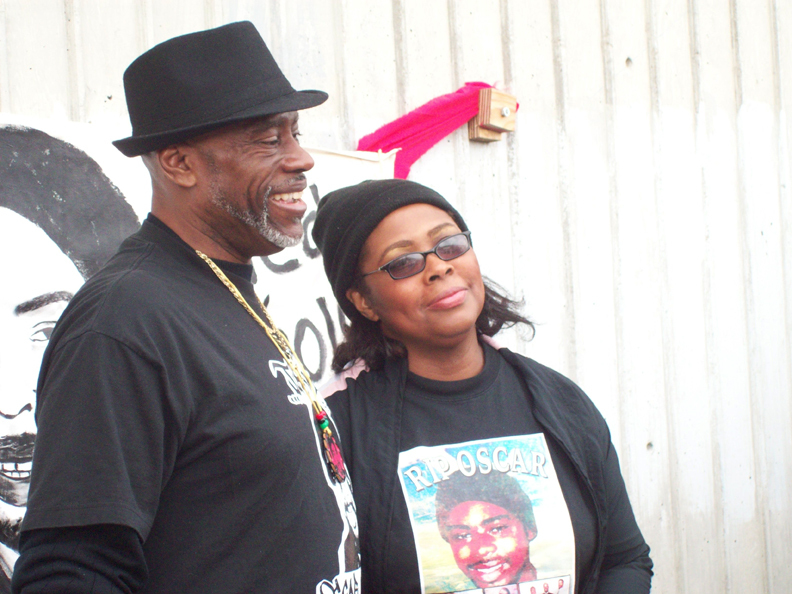 We believe you represent justice and not just for Oscar Grant,” he stated. Speakers at the vigil included Wanda Johnson, Grant’s mother, and several members of his family. “I want the police to take responsibility for taking my son’s life and all the other lives,” Johnson said. The family was very upset when Mehserle received a light sentence of two years for killing Grant, who was unarmed and restrained, on the BART platform in the early hours of the morning on Jan. 1, 2009. Several religious leaders also spoke today. Minister Keith Muhammad of Mosque 26B, located in East Oakland, spoke eloquently about who is to blame for Grant’s death. He noted that it’s not just one bad cop; it’s the entire system that’s to blame. He called on everyone to show with their “deeds” that they are fighting for justice. “We are all Oscar Grant,” Muhammad concluded. According to Uncle Bobby, Grant’s case is now before the U.S. Department of Justice. He called upon everyone to keep organizing and bring pressure on the Justice Department. “By standing together and having one voice, they will be forced to listen to us,” Grant’s uncle stated. Many of Oscar Grant’s family members and friends were introduced and brought to the front of the rally, including his daughter Tatiana, his sister, his nephew and Jack Bryson, a close family friend and another moving force behind the movement for justice for Oscar Grant and all victims of police brutality. A community speak-out was held following the vigil. Dave Welsh, a local leader of the Bail Out the People Movement and a member of the Grant committee, invited everyone to attend the next meeting of the Oscar Grant Committee to Stop Police Brutality (OGC), which will take place on Tuesday, Jan. 11, 7 p.m., at the Niebyl Proctor Library, 6501 Telegraph Ave., North Oakland. The OGC meets every second and fourth Tuesday. The New Year’s vigil was organized by the OGC, ONYX, New Year’s Movement for Justice, Community Action Project and many other groups. Bay Area activist and writer Judy Greenspan, whose work often appears on Workers World, can be reached at judyg@igc.org.